Summary: Red Wolf has a happy life with his parents and The People. He is part of the Anishnaabek nation and lives in close community with nature and the animals around him. The summer before everything changes Red Wolf is befriended by Crooked Ear, a recently orphaned wolf cub who must learn to survive on his own. When Red Wolf is forced to go to a residential school at the tender age of five, he also finds himself in a similar situation. As he grows, his experiences at school change his relationship with his parents and affect his trust of white people, leaving him with limited options and a profound sense of shame. Red Wolf struggles to find his place in the world when school finally ends and only finds his true path after confronting his mother about everything that has happened. Review: In Prime Minister Stephen Harper’s apology speech to the Aboriginal People he called what happened to them a cultural genocide. Thanks to Red Wolf by Jennifer Dance, I now have a better understanding of the true impact of what cultural genocide means. This is another topic that needs to be examined and re-examined in the hopes that we can learn from our sordid history. What I appreciate about Dance’s book is the new, sensitive perspective she gives me about reserves and residential schools. By basing her story at the time of their origin she sets the stage for all the books about the same topic that talk about a later time period. Dance increased my understanding and compassion just as she wished her book would in her dedication. I was close to tears many times during my reading because the Indian Act had horrific results. Separating children from their parents and subjecting them to physical and sexual abuse, religious brainwashing and continuous emotional abuse are all things no child should have to experience and the fact they were mandated by the government makes it worse. But even though I am so disturbed by the subject matter, I love Dance’s writing. The reason why Red Wolf and Crooked Ear are so affecting as characters is because Dance paints a vivid picture through the use of multiple perspectives. It’s a breathtaking portrait of sorrow and it went straight to my heart. I loved reading about Crooked Ear and the special relationship he and Red Wolf have. It lightens the story and I am happy their friendship provides some comfort for Red Wolf. I have read that Red Wolf is for readers in middle grades but I don’t agree. It is a nuanced book with mature themes and needs an older teen or adult reader to fully appreciate it. I think it would also be suitable for a classroom setting. I had more memorable quotes than the ones listed below but they were more passages of the book than quotes and too long to include. Reading Red Wolf is an experience that isn’t for the faint of heart but Dance is a talented storyteller who leaves us with a note of hope in the end. and the long suffering of our First Nations people. “Red Wolf followed the bright sparks that rode a distance on the wind. He felt something warm inside his chest. It wasn’t just fire, or the furs. He glanced up at the ridge and saw them! The wolves! He listened to their howl and his heart was filled with joy. “Crooked Ear trembled, wanting to roll on the ground with the child as he would with another wolf, but something warned him that the Upright pup needed to be treated gently. So he raced in circles until he was calm enough to sit on his haunches and allow the child to throw his arms around him. He licked behind the boy’s ear, Red Wolf’s giggles making the animal’s tail swish back and forth. Red Wolf by Jennifer Dance is published by Dundurn Press, (2014). 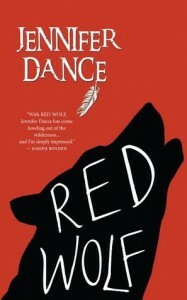 I love your book red wolf!! !